This poem is about a strong-minded woman who would not take no for an answer. 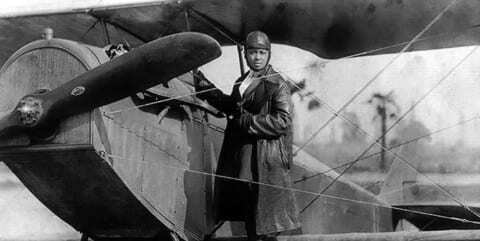 A woman, named Bessie Coleman, who surpassed many things that in those days were difficult. Bessie Coleman, a woman who was strong. She wanted to fly was that ever really wrong? Nothing can stop her that’s what she preferred. She was never accepted to any U.S. schools. So she went to study in France. Doesn’t worry, it was cool. Finally flying through that strong air. Finally, she made it up there. She wasn’t done yet because this feeling, she wanted to share. That’s not what she wanted to do. only 3 percent of airlines. Not giving up to fly. That’s what she kept on doing. Not knowing she going to die. Plane crashes but her time in the sky really lasted. On the way, she loved to fly. Now she really did impress. Though it is not her this time. Now there are other wonders. Strong Minded by Brianna is licensed under a Creative Commons Attribution-ShareAlike 4.0 International License. What a wonderful poem! It’s really cool how you were able to combine poetry with history and create a poem that carries emotional depth and tells the story of Bessie Coleman. I like your rhyme scheme, it was mostly AABBCC with a few exceptions. I like how you described her death with the sound BOOM and implying she died in an crash of some kind rather than just writing out that she died. I also enjoyed how your poem ended on a hopeul note. You gracefully turned a tragic death to an inspirational legacy with the words, Inspiring others, Now there are other wonders. Thank you for this poem! Thank you so much for your compliment! I really loved Coleman’s story. Especially how she did it, and why she did it. I am glad that you understood the meanings and words behind my story. Again thank you for reading my poem.